Garlic & basil spiced chicken served with couscous in a basil infused tomato sauce. Chicken breasts: Place the chicken breasts between two sheets of cling wrap and bash with a rolling pin (or full wine bottle) to flatten (1½ cm). Season with salt and pepper and coat with HALF the Garlic Spice Blend and HALF the dried basil. Place a pan on medium-high heat with a drizzle of olive oil. When hot, add the chicken and fry for 3-4 minutes a side until golden and cooked through. Tomato couscous: Place a pot on medium-high heat, add the onion with a drizzle of olive oil and sauté for 3 minutes. Add the garlic and cook for another minute before adding the REST of the Garlic Spice Mix and the REST of the dried basil. Add the grated tomato, tomato paste and cook for 5 minutes before adding the couscous with water (1 cup for 4; ½ cup for 2). Cover and let is simmer (gently boil) for 1 minute, then remove from the heat and keep covered for another 5-7 minutes, until cooked. Use a fork to separate. Slice the basil leaves and sprinkle HALF into the couscous. 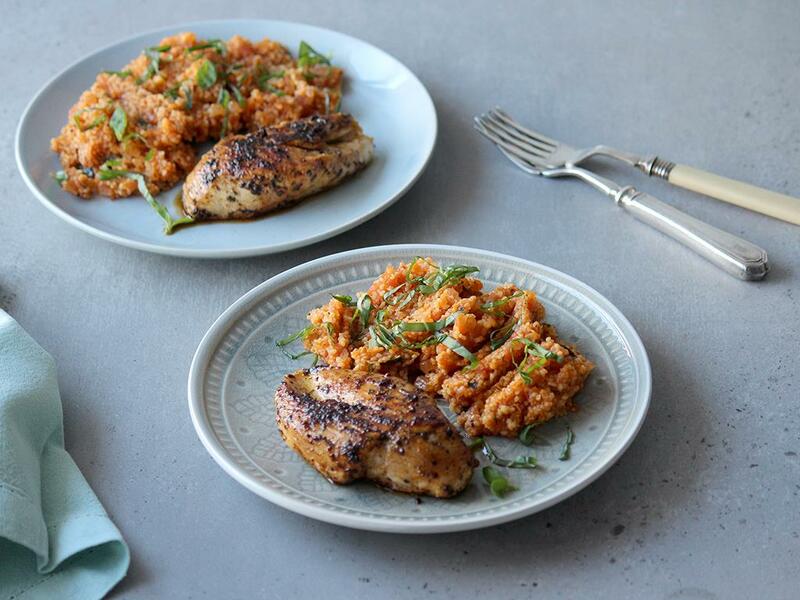 Serve the tomato couscous topped with fresh basil and chicken on the side.